It can be an embarrassing subject, but if we don’t talk about it then we can’t fix the problem. I’m talking about bikini bumps, hair, and everything else that can make you run from the beach. My bikini line routine is a bit excessive (especially for someone who rarely wears swimsuits), but you can take as many tips as you’d like from this and hopefully make your bikini line Summer ready in no time…. 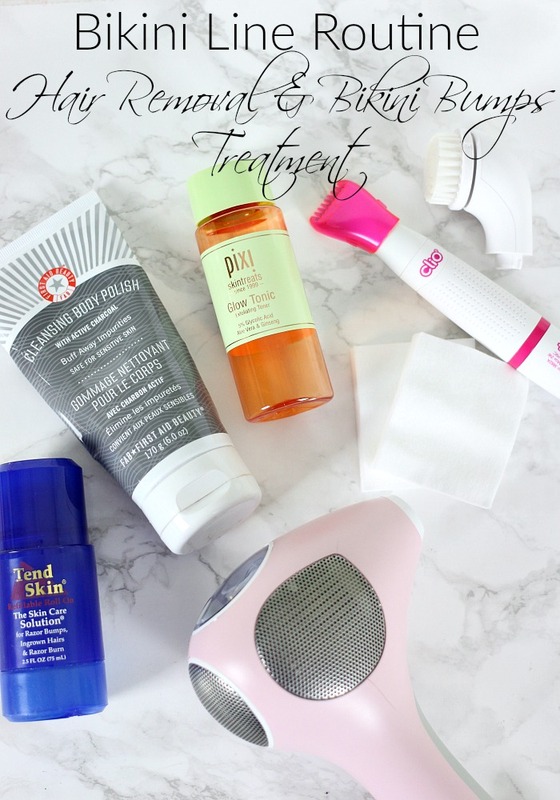 See my full review of the Tria here, and my Back Beauty Tips here. Do you have any bikini line secrets? I also have reviews of my brighteners here, concealers here, neutralizers, primers, powders, setting sprays, foundation brushes, blushes, highlighters, bronzers, brows, waterline liners, eye pencils, liquid liner, drugstore mascara, high end mascara, liquid lipsticks, Pore Minimizing Primers, Illuminators, stick foundations, powder foundations lip liners, drugstore lip glosses, high end lip glosses, gel/cream eye liners, dry shampoos, and drugstore lipsticks.